Nilkanth Dham Swaminarayan Temple is located at Poicha village on the bank of river Narmada which is about 80 kms from Bharuch and 60KM from Vadodara. 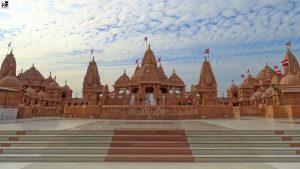 It is beautiful swaminarayan temple constructed in large area and one of the most amazing pilgrimage attracts people around Gujarat. You can have divine experience by visiting Sahajanand universe, Nilkanth dham and surrounding. The foundation of the “Sardar Sarovar Project” project was introduced by Pandit Jawaharlal Nehru on April 5, 1961. On the occasion of his 67th birth anniversary, Prime Minister Narendra Modi inaugurated the Sardar Sarovar dam on the Narmada River. This project, which has been the subject of much controversy for decades, is one of the largest democations in the world. With a length of 1.2 km and a depth of 163 meters, this dam is expected to be divided into three states of Madhya Pradesh, Maharashtra and Gujarat. 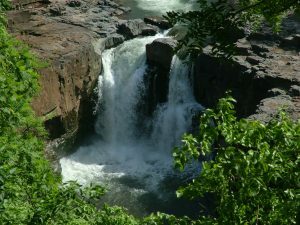 Nine Falls is a spring in Dadiyapada taluka of Narmada district of Gujarat state. It is located on Gujarat State Highway 163. It is about 35 km from Dediyapada. And about 143 km from Surat Is there. Nearest railway station is Bharuch, which is km. The nearest and the nearest airport is Surat. Nike Falls is more than 30 feet in height. It is located in the beautiful forests of Dediapada, besides the Sultan Peshawar Wildlife Sanctuary.The height of Ninai falls is more than 30 feet.Ninai Falls has tremendous beauty around it. It is situated in Dediapada’s beautiful forest ranges besides Shoolpaneshwar wildlife sanctuary.The Narmada district collectorate is promoting the Sardar Sarovar dam and its surrounding tribal region as possible eco-tourism hotspots. This campus is located in Narmada district. It is 28 kms from Rajpipla to Kevadia Colony on Narmada dam site. Is there. It is 7 km from Thawdaaya checkpost. Is there. It is located inside the Sullaparneshwar Wildlife Sanctuary, which is home to plants and fauna. Attractions of wildlife include leopards, wild bears, various deer species and wild dogs. Monkeys and barking deer or mentsjack can also be seen, which are rarely found in other parts of the country. With the help of a forest department, you can organize a picnic or trekking day with jungle, waterfall and other natural beauty. Easy access to other nearby places include the river Javan, Sullaparneshwar Temple, Ghir Khadi. One can arrange for day picnics or treks with the help of the forest department, with the forest, waterfalls and other natural beauty within easy reach. Other sightseeing areas nearby include the Zarwani waterfalls, the Shoolpaneshwar Temple, the Gheer Khadi. 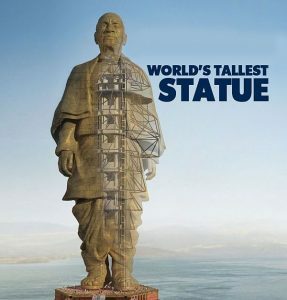 To celebrate the birth anniversary of India’s first home minister on October 31, India’s Iron Man, the world’s largest statue devoted to Sardar Vallabhbhai Patel, is the ‘Statue of Unity’. The monument is 182 meters above the surface and 240 meters above the Narmada River.The monument statue of Vallabhbhai Patel is being constructed facing the Narmada Dam, 3.2 km away on the river island called Sadhu Bet.The Statue of Unity is being designed as a naturalistic and historically accurate representation of Sardar Patel, wearing characteristic garments, in a walking stance.